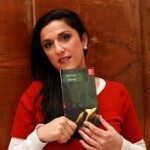 Excellent BBC interview with in-the-news Israeli authoress Dorit Rabinyan in which she gives a concise, clear – and in my view truthful – account of the reasons the Israeli Education Ministry has moved to stop her new novel, Borderlife, entering the national curriculum. Like thousands of others, I will definitely be buying the book once the English translation comes out. All power to her!